Grade 6 can be a great year or it can be a very awkward year if you are Archie. Trying to impress his friend Shamini, Archie tries to be more like his heroes from TV and video games and less like himself. It takes Archie going through many embarrassing moments to realize that he is a good friend and people like him just the way he is. My favourite character is Archie because he seemed really childish and had a lot of good times with his best pals Alfie and Shamini. One of my favourite parts is when Archie and Alfie go to the gym to work out but end up getting chased out by a supervisor because they are not old enough and cause trouble at the gym. This book is a good choice for anyone who is a fan of wrestling or likes ninjas. If are you in Grade 6 I think you would be able to relate and make a connection with the main character in the book. 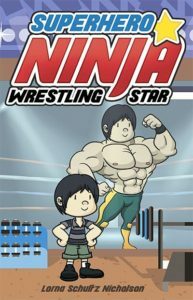 If you are looking for a funny story, Superhero Nina Wrestling Star is the book for you!